Biaffin provides reliable service for the performance of protein kinase A activation and inhibition assays. As an alternative to interaction assays you get data about effects that compounds have on the phosphotransfer reaction of a protein kinase. We are specialised on assays for the cAMP-dependent protein kinase (A-kinase, PKA), but assays for other protein kinases can be established in our lab as well. If you would like to discuss some future projects that we might perform for you please do not hesitate to contact us. We will be glad to discuss your specific demands and their practical realisation with you. 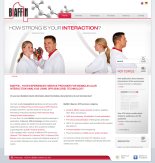 You can send your request via email to info@biaffin.de or you can also call us between 9:00 and 18:00 MET using tel. +49 561 804 4662. Recombinant proteins for different isoforms of the cAMP-dependent protein kinase as well as inactive holoenzyme and protein kinase inhibitors can be ordered from our product catalog site if you want to perform kinase assays in your own lab.